It’s hard to imagine that the 380 m wide by 68 m tall Novarupta dome is the site of the largest volcanic eruption in over 100 years! However, the undulating pattern of the surface in the foreground is the first clue that something more powerful than any of us have witnessed occurred here not so long ago. What is the loudest explosion you have ever heard? How far away could you hear it? 1 mile? 2 miles? 10 miles? What about 100 miles? If something exploded, and you could hear it from over 100 miles away, that would be impressive, wouldn’t it! I can’t imagine an explosion that big. Now, think about an explosion that could be heard 800 miles away, and you are on the scale of the explosion that started the Novarupta-Katmai eruption of 1912! Today, June 6, 2014, is the anniversary of the largest volcanic eruption in over 100 years, the June 6-8, 1912 eruption of Novarupta-Katmai. Located in Katmai National Park in remote Southwest Alaska, the eruption was more like an explosion. The 60-hour blast filled the surrounding valley with sand-like flows up to 700 feet thick in places. And most of that occurred in the first 16 hours! As magma blasted out of Novarupta’s vent, the magma chamber supporting nearby Mt. Katmai also started to empty out Novarupta. With its internal support gone, the top of Mt. Katmai collapsed, creating a massive hole (caldera) that all the buildings in New York City and then some could fit inside. Although I’ve spent a considerable amount of time in Katmai National Park studying this gigantic eruption, it is still hard to imagine what it must have looked like as ash clouds bellowed and the surrounding valley rapidly filled with one ignimbrite package (sandflow) after another. But it did happen, it happened very quickly, and the evidence is there for all to see. Surrounding Novarupta-Katmai, evidence also exists for an Ice Age, preceded by Noah’s flood. You see, Novarupta-Katmai materials rest atop glacial till (Ice Age deposits). And the Ice Age deposits rest atop the 15,000 foot thick Naknek formation, a water-deposited sedimentary rock layer (Flood deposit). Would you like to learn more about this amazing eruption? One way is by purchasing our new Journey to Novarupta audio adventure. Produced by the creators of the popular Jonathan Park creation adventure series, Journey to Novarupta follows our 2009 and 2011 trips to the volcano. It also flashes back to the 1900’s and the expeditions of Dr. Robert Griggs, the first human to see the eruption site. Journey with us as we search for and find evidence of Noah’s Flood, reveal huge problems in the radiometric dating methods use as evidence for millions of years, and more. This family adventure will build your faith as you discover powerful scientific evidence for a young and active planet! Journey to Novarupta is on sale now through June 12, 2014! Click here to listen to the opening scene, and/or to order. To receive the sale price, copy/paste coupon code JourneySale682014. Digital downloads are on sale for $7.99 and CDs for $11.99. By God’s grace, we are in the production phase for the new audio adventure, Journey to Novarupta! We thought a film by this title would be produced first, but Providence is guiding us in a different direction right now. We are so grateful to have Pat and Sandy Roy at the helm, with their 15+ years of experience producing radio dramas (Jonathan Park). The audio adventure is based on the true stories of Dr. Robert Griggs 1915-1919 expeditions to the Novarupta volcano, coupled with two expeditions I led in 2009 and 2011. The world’s largest volcanic eruption in over 100 years occurred June 6-8, 1912 in what is now Katmai National Park in Southwest Alaska. The Novarupta-Katmai eruption of 1912 was 30 times larger than Mt. St. Helen’s 1980 blast. 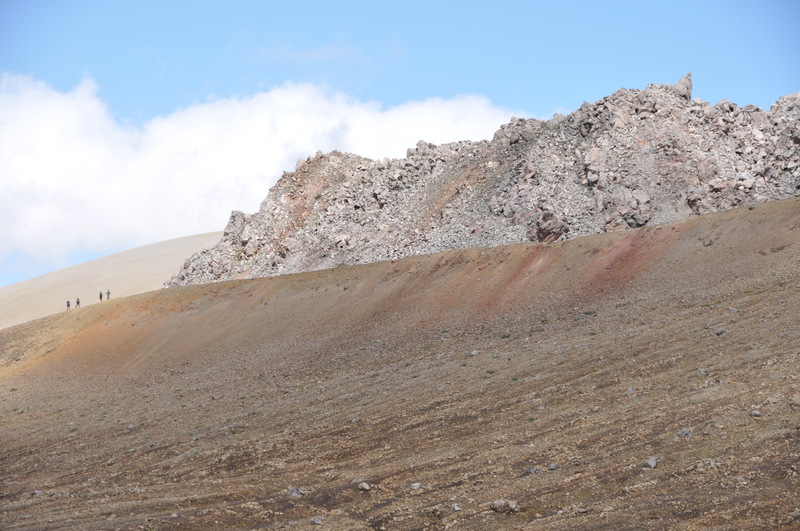 In 2012, 100 years after the eruption, I had a piece of the Novarupta lava dome (in photo above) age-dated using the Argon-Argon method. While eyewitness testimony and historical documents suggest that Novarupta is no more than 100 years old, the Ar-Ar results concluded the rock sample was up to 5.5 million years old! Clearly, something is wrong with radiometric methods. My sample is just one in a long line of samples that give huge errors when radiometric dating methods are calibrated against rocks of known age. Radiometric methods may be useful for studying a rock’s environmental history, but are useless for determining absolute ages. Scripture tells us that about 4,500 years ago, the ground split open and the “fountains of the deep” erupted (Genesis 7:11), flooding the entire globe with water. Today, about 70% of the earth’s surface is still covered by water, averaging over 2 miles deep, and giving us a watery reminder of the year-long, global cataclysm. One of the best ways to understand more about the global cataclysm described in Genesis is to study volcanic eruptions. And the bigger the eruption, the better! This is why Novarupta is so important. Latin for “New Eruption”, Novarupta burst forth for over 60 hours on June 6-8, 1912. The 3rd-largest eruption in recorded history, Novarupta caused tops and sides of mountains to collapse, deposited up to 700 feet of finely-layered ash in places, plus much, much more. 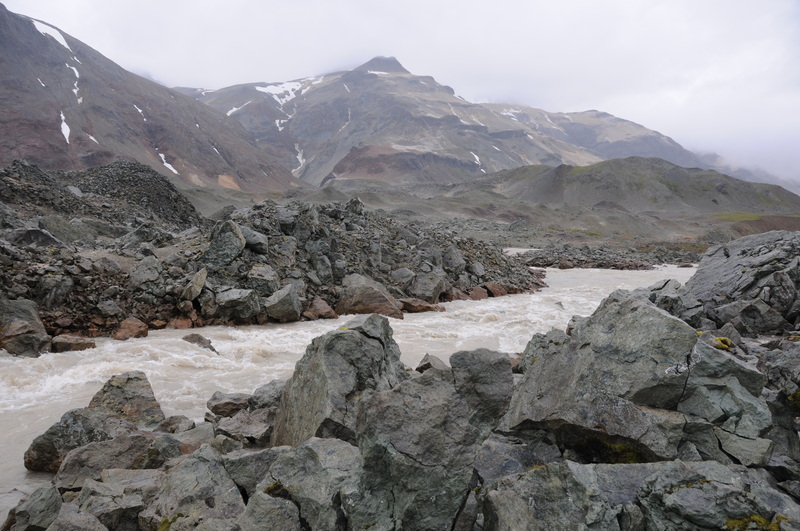 Since 2008, I’ve been studying Novarupta and the surrounding Valley of Ten Thousand Smokes. I’ve been blessed with two opportunities to explore the area with family and friends, once in 2009 and again in 2011. I’ve also published a research paper on Novarupta in the Creation Research Society Quarterly (CRSQ 46(1), leave a comment if you would like a pdf copy). So here’s what’s happening. I donated my footage to CreationWorks, and they are going to use it to make a film about Novarupta! This is their first film project (they have done some radio projects in the past), which they plan to enter in the San Antonio Independent Christian Film Festival. But they need your help! They are hoping to raise $5,500 to cover expenses of producing and distributing. I think the story of Novarupta is worth telling! If you do, too, then please consider making a donation to the project. Click here to watch CreationWorks’ Novarupta trailer. I think you will see that they are off to a good start! To donate to the project, click here (or go to http://www.kickstarter.com/ and enter Novarupta in the search box). And please pray that God world be glorified through this project. Thank you! Below is a .pdf of a presentation I gave at the Greater Houston Creation Association’s September 2011 meeting. Learn about volcanoes, the June 6-8, 1912 eruption of Novarupta and Mount Katmai, and the effects of the eruption on Katmai Valley and Canyon. My son, Ken Cole, myself and several others visited Novarupta in 2009. Ken and Ashley Cole, and I visited the “other side” of Novarupta from July 25-28, 2011 to learn more about the world’s largest volcanic eruption in over 100 years. What most visitors to Katmai National Park see is what we saw in 2009, although only a few dozen adventurers hike out to Novarupta. However, there is another side to Novarupta, that few have ever seen, and in 2011 we set out to explore this mysterious place. The explosion of Novarupta was heard over 750 miles away in Juneau, AK! When Novarupta blew, a magma chamber under Mount Katmai drained, leaving a void that caused the top of Mt. Katmai to collapse. This was about 1 cubic mile of material that fell over 1,000 feet into the void. With cataclysms of such incredible magnitude occurring in such a short period, it is not hard to understand that entire mountains were shaking and falling apart. And that is what is in the image below, the jagged leftovers of a huge piece of Noisy Mountain that came sliding down into the valley, and was later cut through by the Katmai River. Click on the image to enlarge, and note the conical piles which are characteristic of landslide debris. That’s all for now, more will be coming soon of this amazing part of God’s creation!